Twenty-five years ago, a small band of farmers in a very remote, hilly region of Nepal began discussing a shared a vision of sustainable self-reliance. This was many years before the tea industry developed organic standards and standardized methods of production. The Tinjure Tea Farmer Co-operative, when it was established in March 1993 included two women among its 46 founders. Today the co-operative has 250 members with 80 women involved in management and operations. 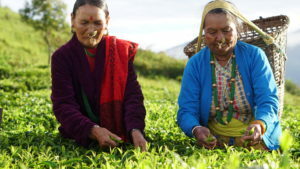 The founding vision of professional farming remains unchanged as the co-operative grew with the assistance of non-governmental organizations and government agricultural resources as well as the Central Tea Cooperative Federation of Nepal (CTCF). Members of the co-operative have learned to successfully process and market tea while securing financial services to the point where they now have the capacity to justify organic and Rainforest Alliance certification essential to serving export markets in Europe and beyond. Phakphokthum is 15 kilometers from the nearest highway. It sits amid the Mahabharat range where peaks rise to 10,000 feet (3,000 meters). There are 734 households. Farmers grow cardamom and tea with a little ginger in the south for cash but mainly tend small plots of barley, maize, rice, and potatoes for food. During the first two decades after its founding, the co-operative’s drivers traveled 46 kilometers to the closest tea factory to sell their tea leaves. The cost of transporting tea that distance, multiplied by hundreds of trips during the plucking season, combined with the low rate they received was not economical. Farmers in the 1990s received a few pennies per kilogram. In 2014, prior to opening their factory, farmers still received only NPRs 70 ($0.60) per kilogram for green leaf. Most of their tea ended up in India where was blended anonymously in bulk. It took 22 years “much effort and hard, challenging days” to enable Tinjure to produce the first of several different black teas. Critical to this step was an initial 50:50 investment from the Commercial Agricultural Alliance (CAA). In the five years since it opened, workers have equipped the factory to produce both leaf and pearl green tea, oolong tea, white tea, and the local specialty ―golden tea―both as loose leaf and pearls. The cooperative and its factory continue to face many challenges in maintaining and expanding physical infrastructure and financing but the world has begun to take notice of entrepreneurial ventures that can meet high standards. “It took them 10 years to access the tea market because of limited marketing awareness,” writes Agriterra, an organization instrumental in convincing Dutch buyers that Tinjure was a good source of high-grown tea leaves. In 2014 CTCF provided Agriterra with several samples of Tinjure tea. These samples made their way to MAAS International, a Dutch tea buyer. In September 2016 MAAS and executives from Agriterra Nepal visited Tinjure to assess its capabilities and in January 2017 MAAS imported its first 150 kilograms from Tijure, investing $60,000 to upgrade the factory’s capabilities. The company also paid for Rainforest Certification (RA), a packaging line and staff training. MAAS promoted the tea as one of its “Impact at Origin” line. The factory is now bagging certified organic tea by hand at origin with attributes that have attracted buyers in the U.S. and France. The export contracts forced significant changes at origin, but the benefits to Tinjure are financial and technical and directed toward making the operation more sustainable. The factory has been upgraded and a new packaging room was constructed. Local women actively participated in creating handmade tea bags, so that the female empowerment in local level will be enhanced. A local marketing and business development coordinator was assigned to monitor and support these efforts. Her assessment of strengths, threats, and weakness revealed new opportunities for Tinjure which included recruiting a female accountant and a field supervisor to oversee compliance with RA certification. After six months Tinjure exported its first order for 20 kilograms of loose leaf. This mission has created a lot of happiness among Tinjure farmers and they are enthusiastically working to make this mission successful.